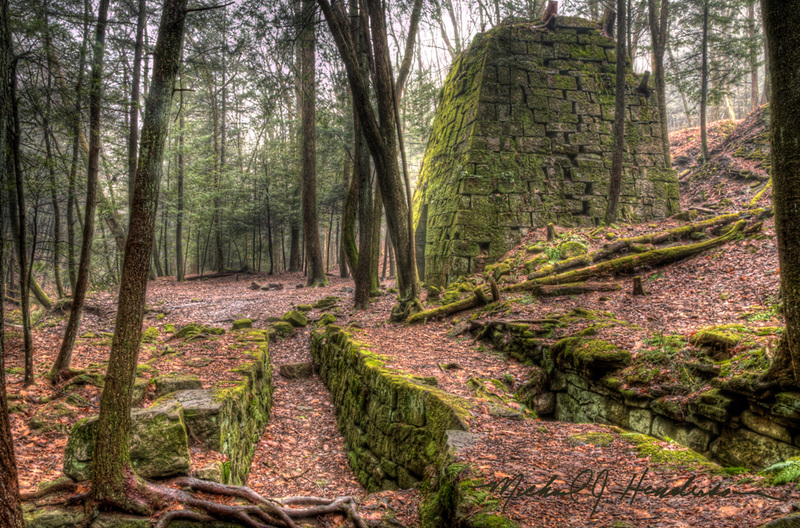 Way off the beaten path in Venango County, Pennsylvania, off State Route 322, down Rockland Road, and along Rockland Station Road, lies this old forgotten iron furnace. During the 1830s, northwestern Pennsylvania, and Venango County in particular, was in a bit of an iron boom. The three ingredients necessary for the production of pig iron, hardwood forests, lime, and iron ore, were in plentiful supply. Most furnaces were located near a reliable source of water for turning a large wheel that powered a giant bellows for blasting air into the furnace. The pig iron they produced was loaded onto wagons and typically hauled to a nearby river (in this case, the Allegheny), where it was loaded onto barges and floated downstream to a steel mill. This particular furnace was built in 1832 by Andrew McCaslin, and historic records indicate that in 1837 it required a crew of 40 workers. One day McCaslin, his wife, and several crew members loaded their pig iron onto a river barge and headed for Pittsburgh. At some point downstream, the barge encountered rough water and capsized, resulting in the drowning death of both Mr. McCaslin and his wife. The furnace changed hands several times during its lifetime, until it was finally shut down in 1854. Notice the unusual twin wheel pits. What is unique about the Rockland Furnace is that it has two wheel races, instead of the usual setup of just one race. In recent years, new research has been done by students at nearby Christian Life Academy, under the direction of teacher Mike Lloyd. Their research indicates that the furnace was actually built upon the site of an already existing grist mill, which had its own wheel race. The grist mill operation was probably the center of a small village nestled deep in the valley of Shull Run, a tributary to the Allegheny River. Old maps indicate this village was named Freedom, although the only modern reference to the name Freedom, at least within the past several generations, is nearby Freedom Falls. Today, nothing man-made remains of the village except the old furnace and its twin wheel pits. 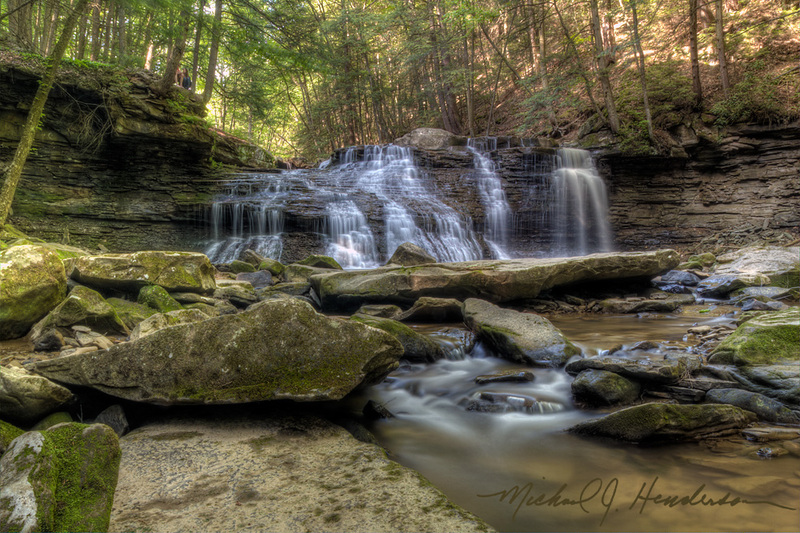 Freedom Falls is located just upstream of Rockland Furnace, on Shull Run. 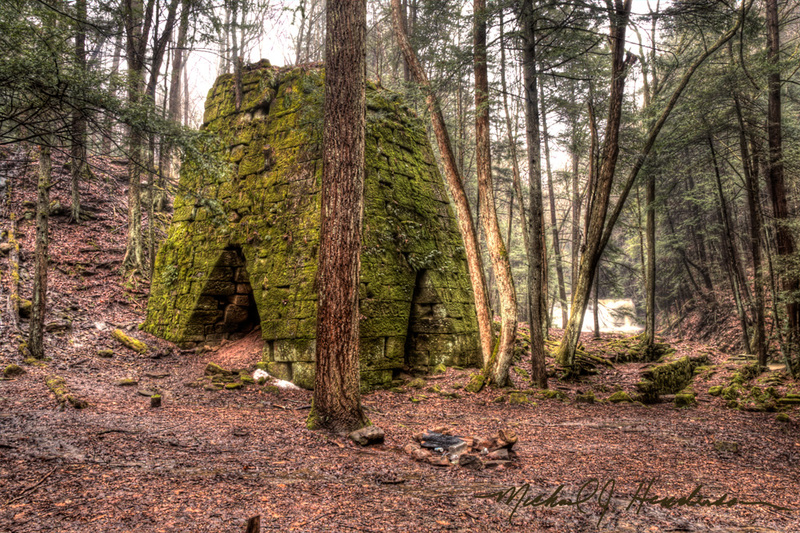 There was or is another iron furnace on the deep hollow road near Oil City. Perhaps it would make interesting photos for you. I have taken pictures of that area myself. I am curious as to how Shull Run came to be called that as it is my family name. Interesting history of the area. Is there a book of this? Hello Sally, sorry for the delayed response! I am not aware of any books on this particular area, although some local students did quite a bit of research on the area immediately surrounding the Rockland Furnace, including the village that was once called Freedom. We are working on a documentary series that will hopefully tell much more about it. Very interesting structure. The falls&surrounding area are beautiful. We visited the Rockland tunnel also.